Introducing THE game changer in the cheese world: Academie Opus Caseus. This two-week course in France, designed to train cheese professionals in all matters of the trade - from cheesemaking and aging to setting a case and sales and marketing - is the culmination of centuries of tradition, years of hands-on experience, and the enthusiasm and expertise of some incredibly dedicated individuals. 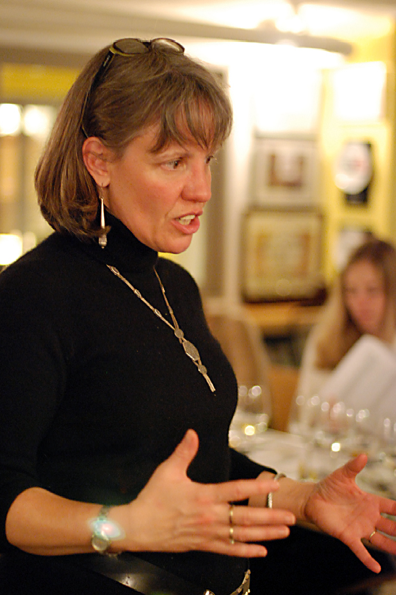 At the helm of the English speaking program is Susan Sturman, someone continually deserving of the 'Above & Beyond' Award that the American Cheese Society granted her in August 2012. I think working in food came to me organically. My mom was a phenomenal home cook, her dad was a catering shop steward in Brooklyn in the '20s?.all our family gatherings were many-course meals, and my folks entertained constantly. Growing up in the 60's and 70's there was a cocktail party or a dinner party almost every week. Food, for me, has always been deeply connected with conviviality, and it's the connections made through food that are really the root attraction for me. Despite my mom's being very territorial about her kitchen, she instilled in me a real sense of the pleasure to be had from preparing food, from serving others, from creating that conviviality. And both my parents gave me a real work ethic, so I've never been afraid to roll up my sleeves and get to whatever work was at hand. I love how tactile working with food is! How did you get your current good food job? I was interviewing Parisian cheesemongers for an article (I still haven't written it but do intend to!) about their take on American artisanal cheese, and Hervé Mons, whom I knew through the American Cheese Society, helped connect me with a number of his fellow MOF (Meilleurs Ouvriers de France) cheesemongers. He happened to be in Paris for the Salon du Fromage that week, and so we sat down and I included him in my interviews. We had a long, far-ranging conversation about life and work values and visions, and I think we both came away with the feeling that there was a great consonance. He was in NY the following month and I went down from Boston to meet him for breakfast, with a big idea in mind to propose to him. Well, he heard me out and said, "Great, that's all well and good and you know I'm on board, but here's what I want you to do." He wanted me to come to St Haon for two weeks to meet his brother Laurent and team up with them to create an english language version of their professional training program in cheese. It took my breath away. I mean, I didn't know he had a brother, much less that MonS had a whole school! It took me about an hour, sitting in Laurent's classroom, watching his joie de vivre in teaching and seeing the outstanding curriculum to decide that this was heaven. This job really pulls everything I've ever done together. I have a degree in PR, and am using those skills to write press releases, develop the brochure and marketing program. My husband and I lived in Paris for 6 years where I attended and later served as Assistant Director for the Ritz-Escoffier Ecole de Gastronomie at the Hotel Ritz. That's where I perfected my French and where I learned about and began to teach cheese, and gained experience in administering a school of gastronomy, in a French context for an anglophone clientele. I taught cooking and cheese for many years after returning to the States, running my own business doing that and catering. I must say that the most important thing I did, looking back, was to pay it forward. I spent 8 years working as a volunteer for the American Cheese Society leading the group of amazing people who created the Certified Cheese Professional ? exam. It brought me into contact with hundreds of people, I learned about managing large projects across great distances via communication technology, and together we created something that is likely to prove an industry game changer. And now I find that when I pick up the phone, people respond to my requests with "of course my answer is yes, after all you've done for the industry"?.I never thought about that when I was doing the work! It just seemed like an important piece of work that needed doing and I could maybe contribute something. What was the greatest obstacle you had to overcome in pursuing your Good Food Job dream? Every day I doubt myself. It takes enormous courage to put myself out there?.to press 'send' on that press release with my name on it. I mean, who am I to be doing this amazing work???? And then I look around me and see the external evidence of what I am capable of and what I've accomplished and I find myself reassured. It also helps to call friends and family and get a reality check. That's the main thing: teamwork. I have so much to learn, and there is so much expertise around me at MonS that to fail would really take some effort. And so much of the curriculum at the Academie is built on teamwork: students working together with the MonS team, as well as truly collegial discussions in the classroom, where everyone contributes their own expertise and insight to the learning process. Cheese in this country has been in growth mode for years, and shows no sign of slowing. Cheesemakers are doing amazing work, creative and expressive, and they are deeply connected to the earth and committed to sustainability on so many levels. Cheese professionals who work post-production have enormous opportunities to carve out careers, and cheese education is in extremely high demand. Affinage is in its infancy here, there is vast potential to do great work. I'd love to see more cheese programs in restaurants at every level, and one day I'd like to see every town in the country with its own cheese shop. I already am. I love the work I do, I love the people I do it with, and I think that in my small way I am providing a true service. That has always motivated me far more than money. That may be why I haven't ever really made a whole lot of it!